Jim Griess returns this April to continue the story of German Russians who came to Nebraska. Jim was our April speaker last year, and everyone agreed we should bring him back to finish the story. All four sets of Jim's grandparents were German Russians who came to the Sutton, Nebraska area in the last quarter of the nineteenth century from the Volga and Black Sea regions of Russia. He follows the story of the German Russian immigrants in his book length study: The German Russians: Those who came to Sutton (Henderson: Service Press, 2008) The book presents a broad portrait of German Russian history and culture and of the causes and history of this group's immigration to America, before focusing in on the German Russians around Sutton Nebraska. Mr. Griess will present our Lunch at the Library talk on Wednesday April 7, 2010 at 12:10 pm on the fourth floor of Bennett Martin Public Library. Bring your lunch and enjoy coffee provided by The Mill! Anyone interested in history or genealogy will enjoy the talk. 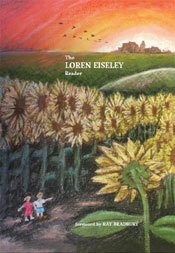 The Loren Eiseley Society is sponsoring two April book launch events for the Society's new Loren Eiseley Reader. The reader, with a foreword by famed science fiction writer Ray Bradbury, is a special collection of some of Eiseley's most popular essays and poems intended to introduce new generations to his work. Book Launch events in Lincoln and Omaha will feature local authors and Eiseley admirers Michael Forsberg, Margery Saiser, Lisa Knopp and others. Location: Lincoln, NE at Great Plains Art Museum, 1155 Q St. Location: Omaha, NE at The KANEKO / UNO Library, 1111 Jones St. The Robert Franke Eiseley Research Collection is now available to researchers and the public at the Heritage Room. Of special interest are a seven page typescript by author Ray Bradbury, Franke's correspondence with nature writer Annie Dillard and with poet Howard Nemerov concerning Eiseley, and extensive correspondence with Caroline Werkley, Eiseley's long time assistant at the University of Pennsylvania. 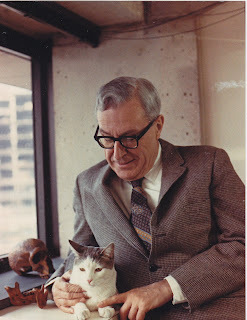 Werkley's snapshot here shows Eiseley playing with a cat. Franke was deeply interested in the religious themes in Eiseley's writing about man and the natural world. Franke's published and unpublished explorations of this theme, including drafts, reprints, sermons, several book proposals and conference notes are included in the collection. Dominique Garay was born and raised in Lincoln. He is interested in writing and performing poetry, especially slam poetry, and in writing plays. Oscar, originally from Mexico, performs music with traditional South American instruments. Working together, Dominique and Oscar will bring us an exciting performance that combines poetry and music. We welcome the dynamic duo as our Ames Readers, Sunday, March 21 at 2:00 P.M. in the Jane Pope Geske Heritage Room on the third floor of Bennett Martin Public Library in downtown Lincoln. The 29th Annual Neihardt Spring Conference topic will be "Neihardt and the Short Story," Speakers will be Chickasaw author Linda Hogan, Dr. James Work of CSU, UNL Professor of writing Ricardo Garcia, and UNL professor of literature Dr. Karen Shoemaker. Dr. Neil Harrison, Dean of English Department at Northeast Community College will moderate. The conference takes place each year on the last Saturday in April, this year the date is Saturday, April 24th.